A chief minister’s sudden death exposes political fault lines in India’s only Muslim-majority state. Had politics taken its normal course, Mehbooba Mufti should have become the first female chief minister of the Indian state of Jammu and Kashmir by now. But, for the last month, she has been delaying that historic moment. It was widely assumed that Mufti would assume office immediately after the death of her father, the sitting chief minister, Mufti Mohammad Sayeed last month. Even four weeks after her father’s death, she is not willing to assume the mantle of the politically volatile state. Speaking her mind for the first time in a month, she called for “new confidence-building measures for Jammu and Kashmir” and the renewal of her party’s alliance with Bharatiya Janata Party (BJP), India’s ruling and nationally dominant political party. Her decision not to form the government has injected political uncertainty into Jammu and Kashmir. It has put a question mark over the alliance between her People’s Democratic Party (PDP) and the BJP. The regional PDP feels betrayed by the BJP for not honoring its political and economic commitments made in the state ten months ago, when the alliance was formed. The BJP promised to provide huge support in for the reconstruction effort in the state and toned down its divisive and nationalistic agenda in the Muslim-majority state. However, the BJP’s financial package never reached the state. On top of that, the issue of a beef ban vitiated the political atmosphere in the predominantly Muslim state, exposing tensions between the Hindu nationalists of the BJP and local population. 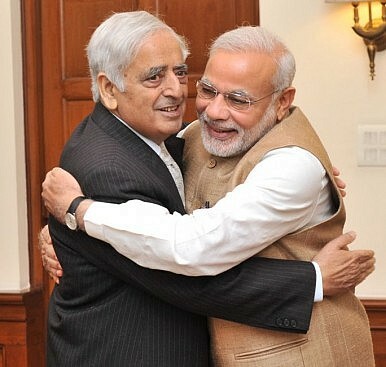 The PDP now realizes that the friendship with the BJP has cost the party its popularity in the Kashmir valley. There is a strong feeling among the Kashmiri organization that the majoritarian agenda pursued by the BJP in its first twenty months in power nationally has not gone down well with the people of the Kashmir valley. The PDP senses that Mufti’s death has come as a godsend, urging the party to rethink its alliance with the BJP. What further shocked the PDP was the thin attendance at Mufti’s funeral, in his hometown in the Kashmir valley. It signaled the erosion of popular support for the party within just a year of having allied with the BJP. The Hindu right-wing BJP suffers from a huge trust deficit in the Kashmir valley. It suffered a huge humiliation in all 36 seats it contested there in the 2014 elections. All its candidates lost their election deposits. The party could win only 25 seats in the Hindu-majority region of Jammu. With the electoral verdict sharply polarized, it was not a popular decision for the PDP, a party rooted primarily in the Kashmir valley, to ally itself with the BJP, which has a history of opposition to the special status of Kashmir in the Indian union. The BJP has always been opposed to Article 370 in India’s constitution, which gives Kashmir a special standing with great autonomy within the Indian union. It has always talked about the Hindu population of the valley, but never took up the issues concerning of the overwhelming Muslim majority there. Given this context, the PDP striking a deal with the BJP was a decision fraught with risk. On Tuesday, PDP leaders met Jammu and Kashmir’s governor, N. N. Vohra. Despite this, the Mufti-led party has not given any assurance about government formation. The political uncertainty in India’s only Muslim-dominated state is not a good statement for the Modi government in New Delhi. If the government collapses or does not complete its term in the office, it would expose the limitations of the BJP as a party and how its divisive agenda and anti-minority politics make it unsuited to govern. Both the PDP and the BJP do not have much space to maneuver. The PDP stands to lose if it compromises for the sake of power and the BJP if it fails to convince its alliance partner of the urgency of forming a government. The Bharatiya Janata Party has withdrawn from its alliance with the People’s Democratic Party in Jammu and Kashmir. What comes next?